German/Tyrolean painter who went to Rome at the age of 16 where he studied with Sebastiano Conca between 1723 and 1728. In 1729-32 he worked in Naples with Francesco Solimena then went to Vienna where he stayed until 1755. In Vienna he won the price of the Wiener Akademie in 1737 and he was the friend and collaborator of Paul Troger. In 1756 he returned to his native city in Tyrol from where he obtained commissions in Southern Germany. His main works are the frescoes in the churches of Frstenzeil, Ottobeuren, and Ettal. 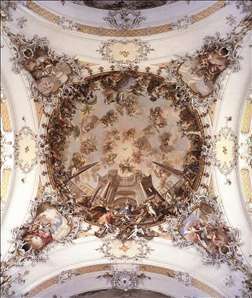 See more details about "Ceiling fresco"